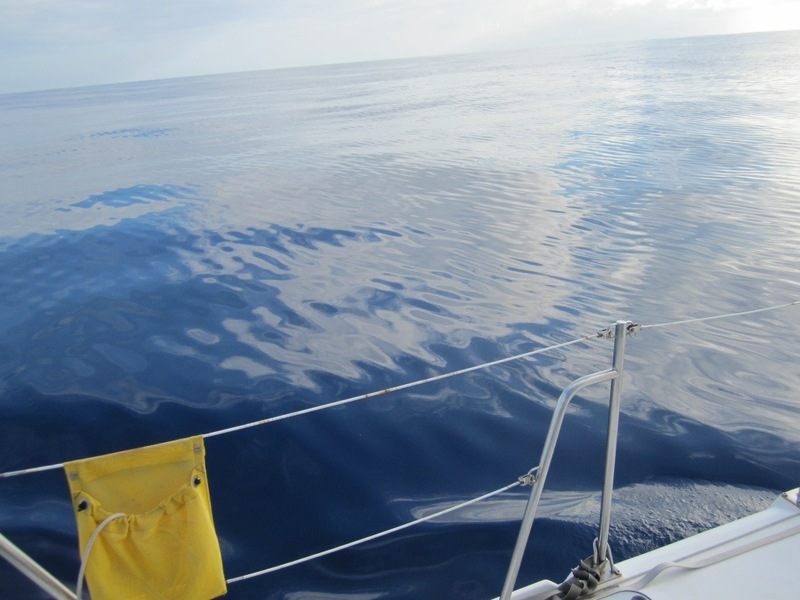 We were facing yet another day of wind less than 5 kts on the nose, motoring slowly on a flat sea. 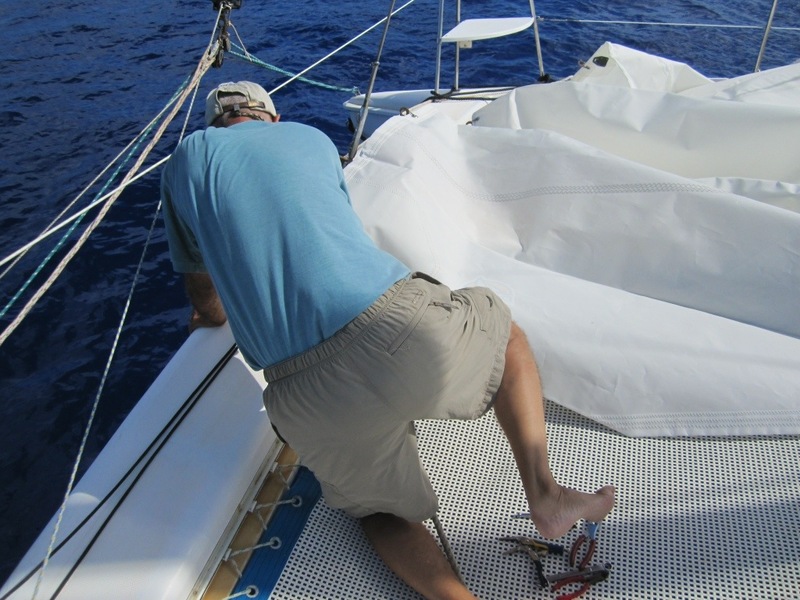 It sounded like a perfect time to attempt a mid-ocean repair on the jib. 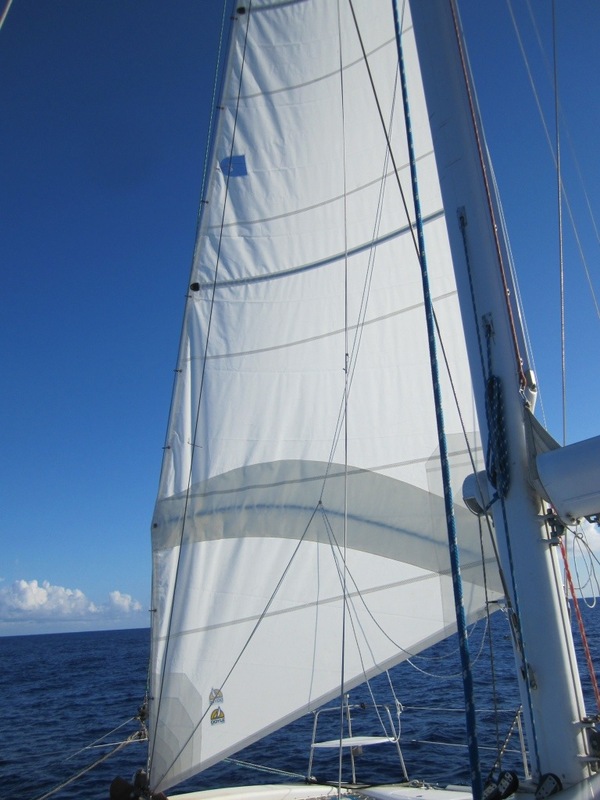 The darn thing is complicated by a big curved spar that fits into a pocket in the sail, attaches to the forestay on one end and the sheet at the back, making the sail self-tending and self-shaping. Hard to describe. The important thing is that because of this spar we can’t just drop the sail, wrestle it over and stitch up the torn bits. The good news is that without wind it’s just hanging like laundry so we think maybe we can sew it in situ, one of us on one side, one on the other, passing the needle back and forth. 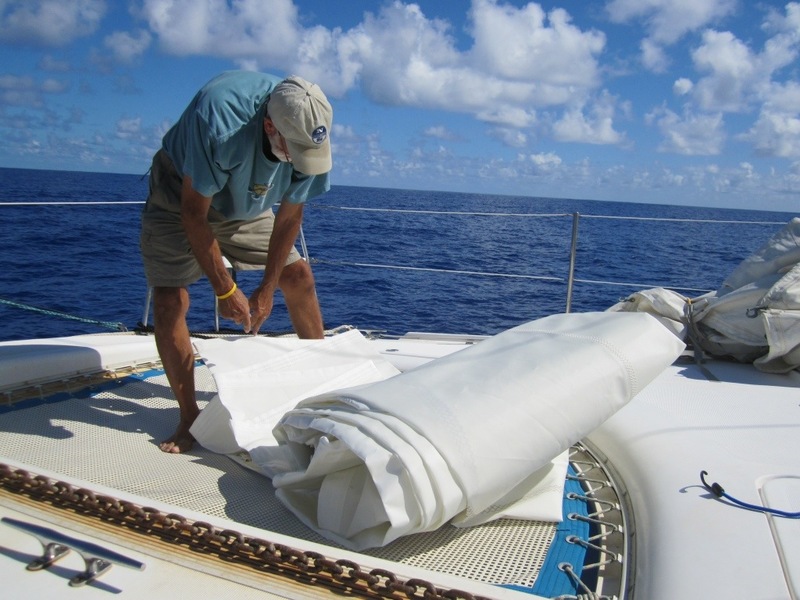 I got out the sewing kit, Jack dug up the sail repair material and we went forward to asses the situation. One thing to know about catamarans is that most of them don’t have solid front decks but rather open spaces between the hulls spanned with heavy netting called trampolines. This keeps the weight down, and the tramps make great places for sunning. They don’t make great places for standing with a sharp needle in your hand while bobbing along in the ocean. I told Jack I thought we should just take this old rag down and put on our new jib. With that we both gathered the tools we’d need, looked up the appropriate pages of the manual, planned the disassembly of the lazy jacks and the spar and set to work. It went so well for a while. We got the old jib off, oriented the new one so we could get the spar in the pocket without too much ado. I guided it in one end and Jack reached deep into the other end to guide it out. “I feel like a large animal veterinarian,” he said, buried up to his shoulder in the spar pocket. Now the hard part. 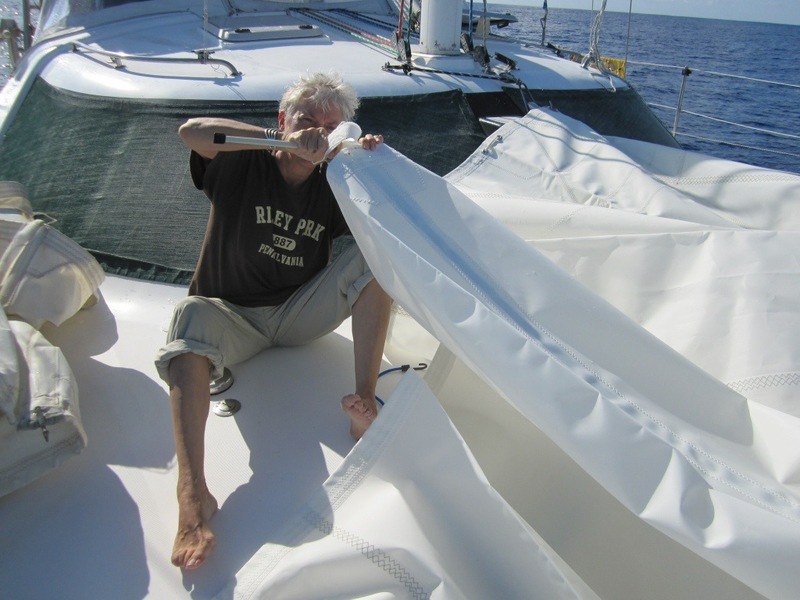 Two people, one bolt, four washers, a nut, a heavy spar with a wheel on the end that has to line up with the headstay while attaching two grommets on the sail. Then, with both of us hanging over the bow wrestling the parts together, the one crucial irreplaceable part squirted out of my hand and dove to a watery grave. I can’t believe I did that. Neither could Jack, and he let me know about it in oh, so many colorful ways. For what seemed like a long time. But life is short and we’re in the middle of the ocean and here’s this beautiful new jib — hey, wait a minute! It’s just a jib. We can fly it without the stupid camber spar, I told Jack. But he was still inconsolable so I set about figuring how to attach the self-tending sheet thingy when another idea hit me. A shackle could replace the part I lost! I said this to Jack, who immediately rejected the idea but set about unearthing our shackle inventory anyway, God bless him. He came up with four. One was clearly too large, two were a bit too long to keep the end of the spar against the forestay, but the fourth, now that one might work! We checked it out and sure enough, it was the perfect length, but the opening was a millimeter or two too small. Jack test fitted it over and over. It was a tight squeeze, and we have to do this while hanging over the bow. But at this point it’s our best option, so we go for it. And Jack got out a more serious persuader. “Frank taught me this,” he said, as he wielded a big wrench. Jack’s dad Frank taught him everything he knows about tools, mostly that bigger is better. Duly armed, we got into our precarious positions on the bow and wrestled and wrangled and pounded and cursed until the shackle submitted and was bolted around the forestay to the spar. Success! 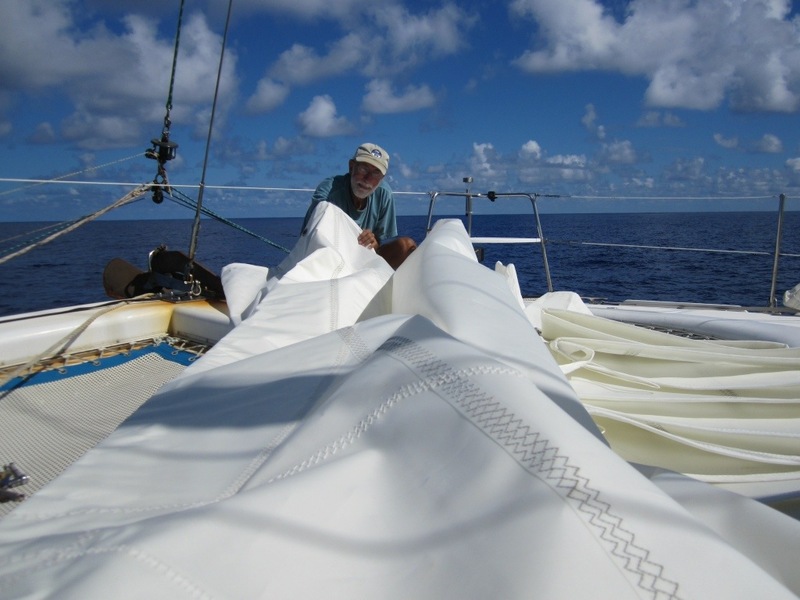 We hanked on the rest of the sail and installed the battens. By this time we were exhausted. “That was step one,” I said. Jack looked up in shock. “We still have to figure out the lazy jacks.” These are lines that cradle the sail when we drop it so it doesn’t fall all over the deck, or worse, overboard in high winds. We discovered that our new sail is lacking certain crucial attachment points for the lazy jacks so we just had to wing it. 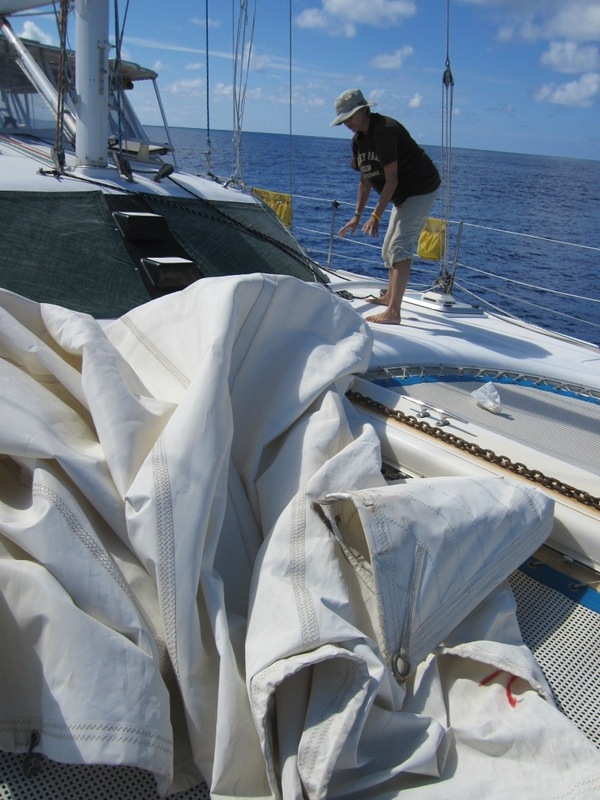 Same with the downhaul, the line that helps us pull down the sail. And then the moment of truth. We attached the halyard and raised her up. Woo-hoo! Nothing beats a nice new sail, and even with a jury-rigged spar attachment, she looks great. Three hours had gone by. Every toolbox and bin on the boat was strewn about but we had our great make-it-work moment. 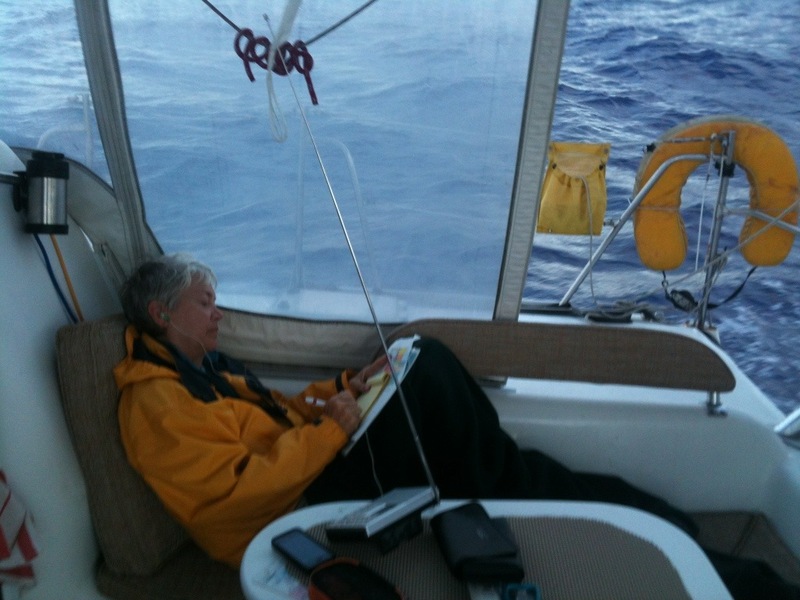 We spent some time straightening up, then looked at the chart and the wind. Little wind, still on the nose. That nice new sail isn’t getting us anywhere. Just like Roland the Volvo diesel mechanic has his Jesus Clip, we Manta Catamaran owners have our own version of the Jesus Clip. It’s one of the first stories I ever heard on Mantatech, a Yahoo group just for Manta owners, former owners, supervisors, designers, workmen, don’t even bother, you have to own one. We couldn’t even log in until they were sure we owned Escape Velocity. It’s a great group and a real lifesaver for a guy like me. Mantas come with a rare bit of kit called a camber spar, I’ve made my peace with it but it took a while. 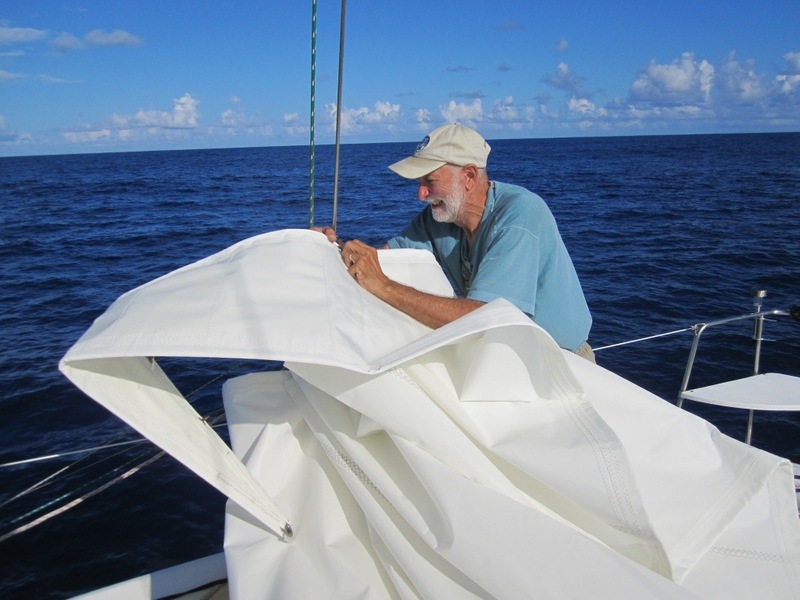 It’s not important how it works but it has a heavy metal tube that is curved inside a pocket sewn into the jib sail. The tricky bit is how it attaches the jib to the forestay, and here is the Jesus part. On the front end of the Camber spar is a wheel that rolls up and down the forestay and on the other side, drumroll, a staykeeper! Never heard of it? Me neither. Manta folklore says to never try to bend on a Manta jib unless you are securely tied to a dock. Have I mentioned that our old jib has growing tears that are getting larger every minute? We went up on the tramps to mend the tears and realized that our old jib has seen its last rodeo. I got out the Manta bible and looked up the Camber spar thingamajig and saw that the staykeeper came in two models. Ours has the bolt instead of the oft lost pin so no worries. Guys with the pin model say that when you lose yours, and you will, buy a half dozen. Worry mate, worry. We sussed out the order of disassembly and got to work. I’d have to say difficult but not impossible. Might have been easier if we weren’t out bobbing around in the Atlantic. The last bit of torture was assembling the…wait for it…staykeeper! Marce my faithful #1 was by my side hanging on out on the tramps. 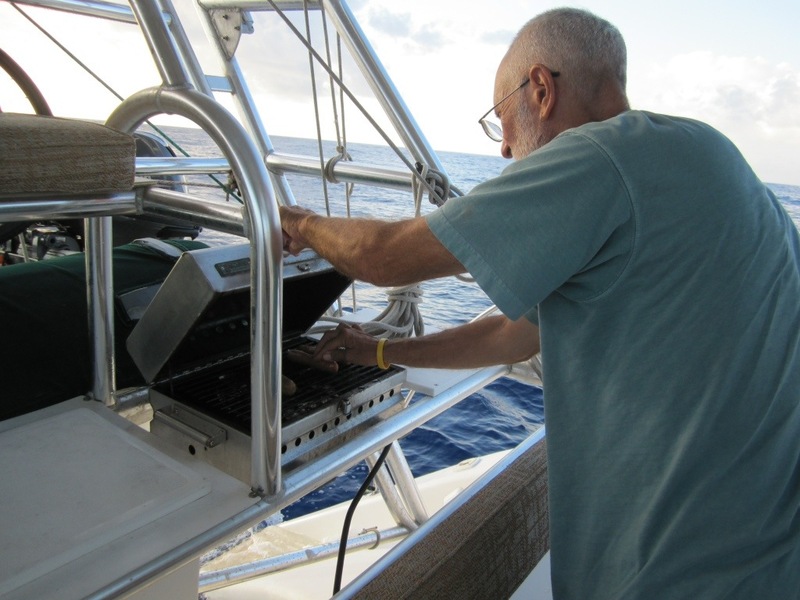 I looked at all the stuff in my hands and knew that if I dropped the…staykeeper…we would have no jib, at least one with a camber spar in it, and we still have a long way to go. So I handed it to Marce. Much more sure handed than me. Well this last bit is one of those fiddly things that takes finesse and brut force while holding on to little custom fittings, while trying to stay on the boat. I saw it all in slow motion again. First it squirted out of her fingers spinning backwards flashing in the sunlight, bounced once on the fiberglass crossbeam, I had a thought that if I didn’t have all these parts in my hand I could make a dive for it, then it took on frontward rotation and disappeared into the steel blue Atlantic. The look on her face was heartbreaking but I can’t imagine what my expression looked like. After writing the big book of salty sailorly expressions, I was calm enough to listen to her idea of how to improvise a solution. I was sure I could never find a shackle with anything close to the exact dimensions…but I did! Close but not quite, It took hours of hard work and a certain amount of persuasion, but we made it work. Our new jib is bent on and if we had any wind it would be pulling us right along right now. Now, where can you find a spare staykeeper? It’s been a week since we’ve been completely cut off from the world: no cell phone, no Internet, no news. Four or five times a day I listen to the weather as broadcast by Chris Parker or the Coast Guard, and I spend what seems like hours scanning the radio dial looking for news. Of anything. Anywhere. I can always find religious stations broadcasting clear-as-a-bell entreaties to repent but I can’t find NPR or the Beeb. Years ago I had my trusty Sony ICF-2010 shortwave receiver in the kitchen of our house and listened nearly every day to BBC World Service programming. Then they decided they didn’t need to broadcast to North America on shortwave because most people could listen to the online stream. A great hullabaloo ensued with petitions and letter-writing campaigns, of which I was a part, but the decision was made and now there are no shortwave frequencies in North America where you can find World Service. Armed Forces Network rebroadcasts some NPR programs on shortwave but I’ve been unable so far to tune anything in. Imagine — especially if you are news junkies like we are — being so out of touch with what’s going on in the world. It’s torture! This morning I was a little early sticking the earbuds in for Chris Parker’s 6:30am weather report so I scanned the regular AM dial just ’cause. Eureka! There was a garbled voice in English and I focused my whole attention on fine-tuning the signal. What joy, followed by disappointment, to find it was Howard Stern. I had a readable signal for about a minute during which I learned that Margaret Thatcher’s funeral is today and someone bombed the Boston Marathon. Holy cow! Then the signal disappeared and I couldn’t find another signal again. Rats! It’s been days now that we’ve been slowly motorsailing at a walking pace. We’re lucky in that the weather is beautiful — clear, calm, not too hot — but unlucky in that this is a sailboat and we could be going at least twice as fast with a nice breeze. And for free. But it is what it is. The sea is glassy calm and the barest of breeze is dead ahead. We keep our poor torn jib up because we delude ourselves that it’s giving us lift but in truth it probably isn’t. Yesterday a squall passed us by. We could see it, we could track it on radar, and we even got a bit of a wind shift as it rolled behind us. 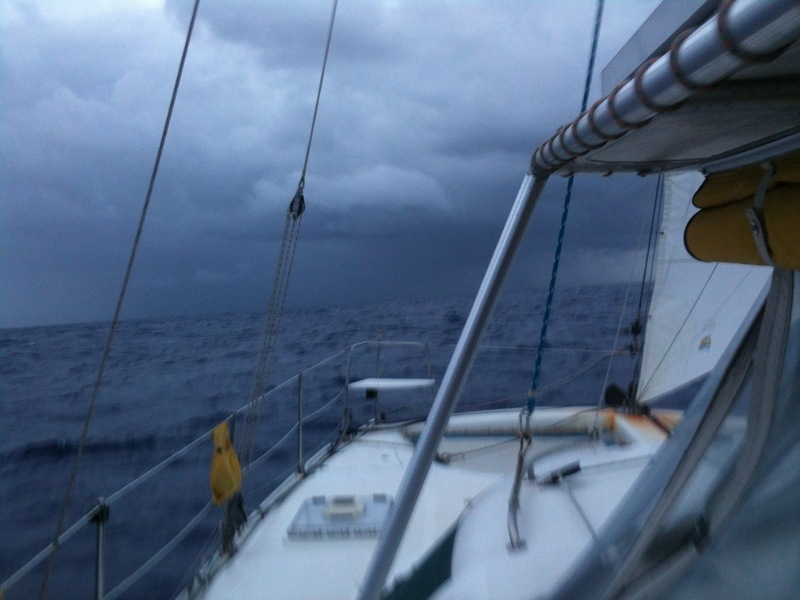 We actually hoped it would hit us so we could sail some and turn the engine off, and even raised the mainsail in anticipation. But after about 15 minutes we could see it wasn’t doing anything for us so we furled it again. So day after day we sleep, read, eat, repeat. I finished “The Unlikely Pilgrimage of Harold Fry,” read “Bill Bryson’s African Diary,” and “Silver Linings Playbook.” Tuesday it was so calm we fired up the grill and had dogs and beans, a day late for Monday Beans. 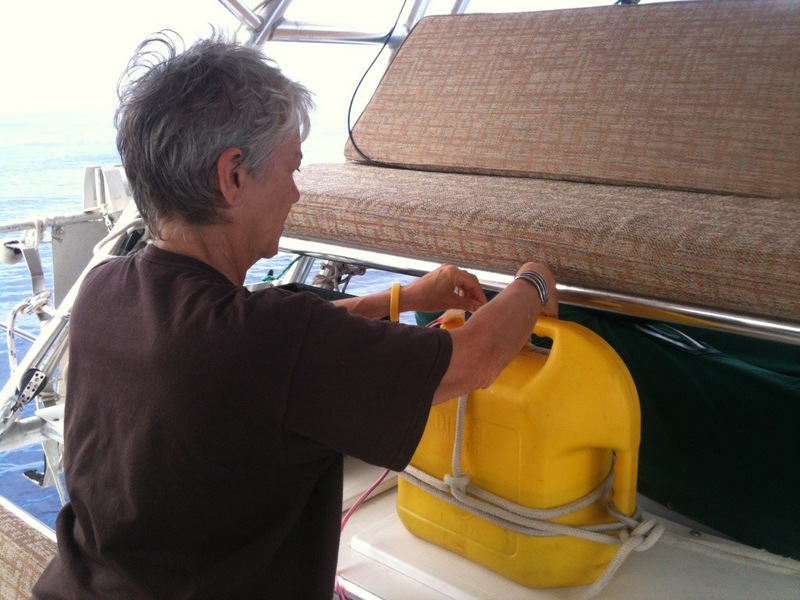 Today we siphoned three jerry cans of fuel into the tank. I’m concerned about fuel; Jack is worried about water. We’re in water conservation mode, and seriously, 80 gallons of water for two people will last weeks. Normally our toilets flush with fresh water so we’re using a bucket of seawater instead and only use the fresh water for drinking, cooking and washing up, which sadly doesn’t include a shower. As I said, it’s lucky it’s not hot so we’re not sweaty, but still, I think I’ll change my t-shirt today.